When you need that special sympathy gift to uplift the spirit in times of loss and grief. We’ve compiled a listing of the most unique sympathy gifts and grief products. Our intention is to gather only the highest quality and most unique products that address loss and grief to help you and your loved ones during this difficult period. Take your time to look the the special grief products and unique sympathy gifts that are offered by each company below. Voicemail Transfer Service - Your Cherished Keepsake. In your time of loss, you discover that your loved one left you a message on your voicemail, but it will be deleted in 30 days! What can you do? Our service will transfer those precious, irreplaceable messages to CD or .mp3 for your permanent record. Angel Lapel Pins. What better way to cherish the memory of your loved one or honor the accomplishments of your friends or family than with our high quality guardian angel pins? Our unique angel pins are sure to touch everyone’s heart. Hundreds of unique styles. Each Angel Pin is made of gold and silver plated material at affordable prices. Prices range between $10 and $22! Customization at no additional charge. Helpful Free Articles on Grief, Loss and Mourning. Guy Finley has written supportive and awakening information that is spiritually-based. His free articles are immediately available online. His Life of Learning Foundation additionally has many other wonderful books, booklets, ebooks, CDs, DVDs, on many topics to help individuals to release their emotional pain and blocks to happiness. 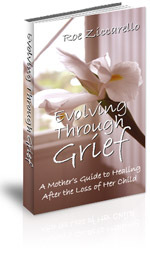 Evolving Through Grief: A Mother’s Guide to Healing After the Loss of Her Child. In this ebook, Roe Ziccarello conveys a sense of hope for others who are grieving a loved one. Her supportive tips and suggestions on coping with grief come from her own painful loss of a child, but anyone in mourning will be greatly comforted by her words. Roe shares her journey through her warm writing style, her poetry and her songwriting. She writes about surviving the loneliness, pain and heartache. She reveals her experience with the denial, shock, numbness, anger and helplessness. She explains how she desperately needs the grief support from family and friends but actually craves to just be alone. Roe Ziccarello is an unwitting authority on bereavement, grief, suffering and sorrow — she’s lost her sister, two best friends, two brothers, mother, father, brother in law, and her son. The First Year of Grief: Help for the Journey - e-course by Marty Tousley. You can offer support and comfort over the coming year in the form of this grief-healing course. Each lesson (24 in all) will arrive in your friend’s or loved one’s inbox every other week to provide a unique form of ongoing support and guidance. Because it’s so uneven and unpredictable, with no specific time frame, grief can leave one feeling disoriented and out of control, especially during the first year. The lessons in this course are designed to support, comfort and maneuver the mourning process. Tiny Footprints on a Mother’s Heart. Miscarriage, Stillbirth and Infant Loss Jewelry. Customised jewelry to celebrate the life of a child lost in miscarriage, stillbirth and infant loss. Each piece is created using carefully selected symbols to help support the grieving parent after the loss of a baby. One of the most unique sympathy gifts you will find. Personal Creations Shop 200+ Personalized Gifts from $12.99. This company personalizes and customizes beautiful and meaningful items that are perfect for expressing your sympathy. Their prices are very reasonable. Including frames & prints, inspirational, jewelry, keepsakes, pets, stones & urns, ornaments and veterans. Other thoughtful gifts links recommended by Sound Feelings.